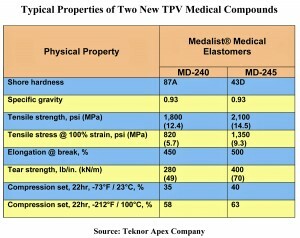 PAWTUCKET, RI, U.S.A., December 17, 2012: Teknor Apex Company has developed two high-hardness grades in its Medalist® MD-200 series of thermoplastic vulcanizate (TPV) elastomers, extending the already broad durometer range of these resilient, high-purity compounds for replacing rubber in medical applications, the company announced today. Teknor Apex will introduce the compounds in the U.S. at MD&M West (Booth 2526) and in Europe at MedTech (Stand 1L44). Previously ranging in Shore A durometer from an ultra-soft 15 to a semi-hard 80, the Medalist MD-200 Series now includes an 87 Shore A compound, MD-240, and a 43 Shore D grade, MD-245. The 43 Shore D durometer is roughly equivalent to a Shore A hardness of 93. The new compounds can be extruded, injection molded, and blow molded. Suggested applications include peristaltic tubes, collection and drainage tubes, stoppers for vials, caps and plugs, seals and gaskets, device handles, ergonomic soft grips, valves, and diaphragms. The rubber-like properties of Medalist MD-240 and MD-245 include low long-term compression set, high fatigue resistance, prolonged flex life, stability at high temperatures, abrasion resistance, and long-term sealability. [A table of properties accompanies this news release.] “Among the benefits of the TPV technology developed by Teknor Apex for the MD-200 series are the elimination of the need for pre-drying, since all grades are non-hygroscopic, and a light natural color that permits efficient use of colorants,” said Keith Saunders, senior market manager for the Thermoplastic Elastomer Division. 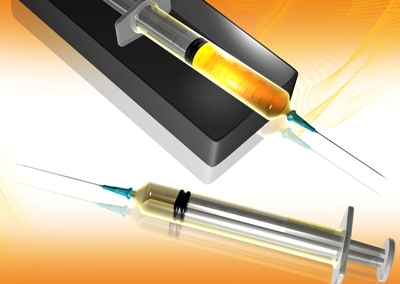 Teknor Apex produces Medalist compounds in dedicated ISO-13485-certified facilities. All standard grades are FDA, RoHS, Coneg, and REACH compliant, are Drug Master File (DMF) listed with FDA, and are biocompatibility tested in accordance with ISO-10993-5. Teknor Apex has developed extensive data for all grades on chemical resistance and resistance to steam, gamma, and EtO sterilization. Medalist compounds are free of animal-derived materials, phthalates, latex proteins, and bisphenol A.